Psalm 24 is one of my favorites and it has lent itself to profound use by the Christian church. Christian tradition came to associate this psalm with Easter and Ascension, and that is how George Frideric Handel used it in his masterpiece Messiah. You can watch a fine performance of this segment of Messiah here. Or, a much grander but less authentic performance here. The great composers were, of course, steeped in Christian biblical tradition and Handel wrote entire oratorios and even operas that were either direct quotes of the Bible (as was Messiah) or derived their content from the Bible, especially what Christians call the Old Testament. Christian use of Psalm 24 is an example of what we call “typology”. This is very different from “prophecy”. 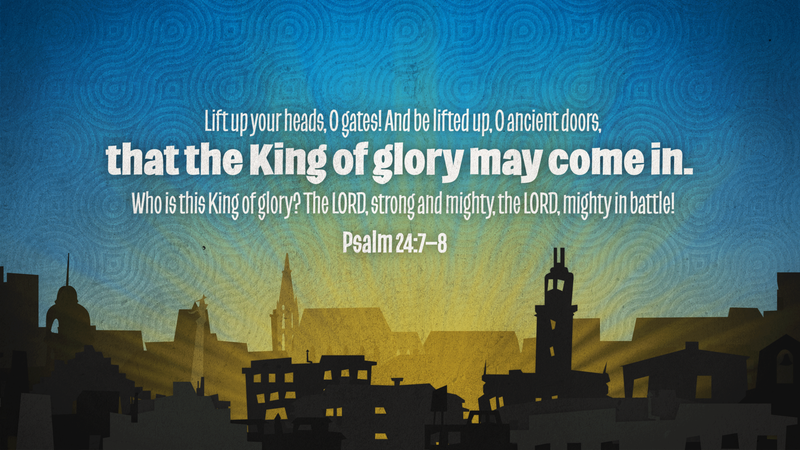 The fact that Christian tradition uses this psalm in connection with Easter and Ascension does not mean that it was composed by David as a prophecy of Christ ascending to heaven. Not at all. What Christian tradition did with a psalm like this is to look at the imagery of the psalm and transfer it to something in what we know about Christ – in this instance his ascension to heaven 40 days after the resurrection. So a “type” is not a prophecy of Christ, but an image or event in the “Old Testament” that foreshadows an event in Jesus Christ. Originally this psalm would have been what scholars call an “enthronement psalm.” It probably refers back to the desert years of the Jews after the exodus from Egypt, when they set up the tent of meeting where God came down to speak with Moses. When the ark of the covenant was built, it was carried by the Jews into the promised land, and it was often carried into battle during the two or three centuries before David composed this psalm – hence the reference to the “Lord mighty in battle.” Eventually when the Temple was built in Jerusalem this psalm of David was probably used to celebrate the enthronement of God in the Holy of Holies of the Temple, where the ark of the covenant was placed. The historical background of this psalm is all very majestic, and people need majesty in their lives. So when the early Christians, and the church tradition that developed over time, needed imagery to represent the majesty of what Christ has done for us, they borrowed heavily from the scriptures of the Jews. I have always been thrilled to see how much of the New Testament is indebted to what is commonly called the Old Testament. As I’ve said so many times I personally do not like this division between Old and New Testaments. It’s one whole. The scriptures for Jesus were what we call the “Old Testament”, and if he didn’t call it Old why do we? Jesus took up the imagery and language of the scriptures as his daily speech. Even on the Cross he quoted Psalm 22, “My God, my God, why have you forsaken me?” When David wrote those words he was speaking of his own situation, not prophesying Christ on the Cross. But when Jesus felt the loneliness and pain of the Cross and his abandonment by everyone except a few women, no more fitting words came to his mouth than these words of David. It’s only when we look at the majesty of God and God’s creation that we have a proper understanding of our own role and our own place in the grand scheme. When we don’t look at the majesty of God’s creation we end up with an overblown sense of our importance. We need majesty in our worship and in our experience of God. When we turn God into an imaginary vending machine in the sky or blasphemously refer to God as the “man upstairs” we are far from the majesty that David and Jesus Christ experienced and communicated to us. Thank God there is still majesty in our Liturgy. It still connects us with the historical events of scriptures, and it’s not just about us and “my needs”! It still connects us with the natural world through the offering of bread and wine and our various sacramental and sanctifying acts throughout the year. We are not a dry place of cushioned seats and empty walls that represent empty modernism rather than the majesty of God. And yet, even we, the inheritors of majestic language and imagery, come to worship to satisfy some imaginary and selfish “needs” rather than experience and worship the majesty of God. Why do Americans love British monarchy so much? A huge chunk of PBS programming is fixated on programs about the British monarchy, borrowed from the BBC. Is it because we long for majesty in our lives? If so, why do we waste our time on British majesty when we can experience divine majesty? Majesty on high – Majesty around us – Majesty in our lives! Thanks be to God for giving us a taste of his majesty, the majesty that awaits for us for all eternity. Start experiencing it, start seeing it, start tasting it. Categories: Bible Reflections | Permalink.